Conservatories, sun rooms and orangeries make fantastic additions to homes but, for some frustrated homeowners, they can’t always be used throughout the year. Due to being too hot in the summer and too cold in the winter, a number of property owners can’t make the most of this sizeable investment. 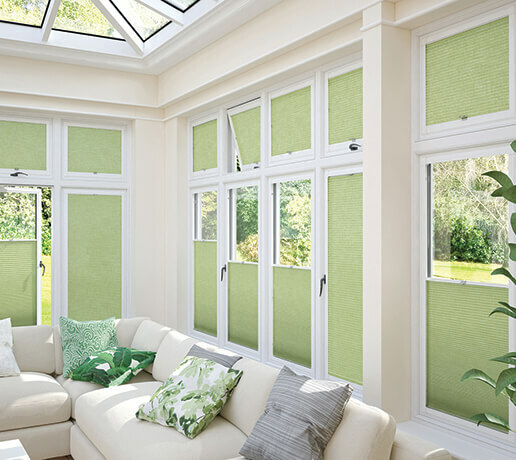 Here at CAH Blinds, we provide a range of conservatory blinds to help manage temperature control problems, ensuring that property owners in Crawley, Horsham and the surrounding areas can always enjoy their additional living space. Operating out of East Grinstead, we provide these made-to-measure blinds to customers across the Sussex and Surrey region. To arrange for an initial consultation at your home in Crawley, Horsham or the neighbouring areas, please contact us. As a structure made predominantly of glass, conservatories heat up quickly in the right conditions but also struggle to retain that warmth. On particularly hot days, this can make for an uncomfortable environment. During cold snaps, conservatories without blinds are all but redundant. With the addition of conservatory blinds, homeowners can regulate the temperature and filter out harsh sunlight in the summer while retaining warmth from heaters during the winter. What’s more, with made-to-measure blinds, they fit the existing design and colour scheme in conservatories of all shapes and sizes. Here at CAH Blinds, the conservatory blinds that we provide for clients in Crawley, Horsham and throughout Sussex and Surrey come in two main forms: roof blinds and side blinds. Below, we have outlined the differing roles undertaken by these two styles. Covering the windows around the side of conservatories, side blinds can be utilised in a variety of ways. Conservatory blinds consisting of thin materials allow for a filtering of light that lends a relaxing ambience to the room. However, this type of side blind only offers minimal insulation. Thicker materials, including blackout varieties, don’t just reduce light entering a conservatory, they can stop it altogether. Naturally, these thicker conservatory blinds provide our customers in Crawley, Horsham and beyond with better insulating qualities. Our range of made-to-measure blinds also play a vital role in maintaining privacy and security. 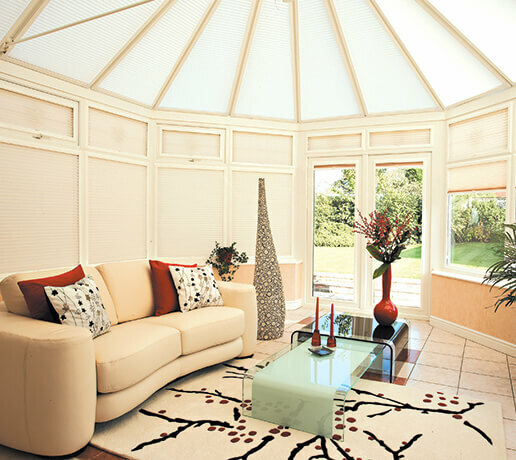 Sunlight enters conservatories at multiple angles throughout the day. In order to gain full temperature control, roof blinds also need to be fitted. With simple sliding control mechanisms, roof blinds can be used as easily as their side equivalents. Multiple-panel installations allow homeowners in Crawley, Horsham and the surrounding areas to perfectly manage how much light enters the conservatory during the day. With this level of control, temperatures can be regulated to create a comfortable, relaxing atmosphere. We manufacture these made-to-measure blinds to the exact specifications of any conservatory, ensuring the perfect fit. For more details regarding conservatory blinds in Crawley, Horsham, East Grinstead and the neighbouring areas, call 01342 328 364.